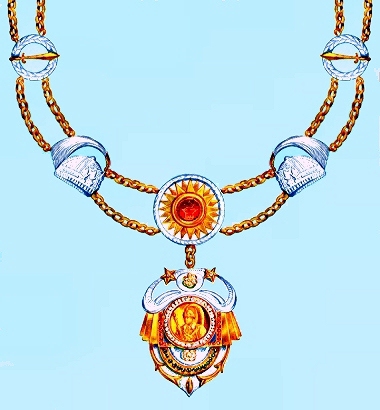 The Most Glorious Mahendra Chain (Mahendra Mala Manapadvi): founded by King Mahendra on 26th February 1961. 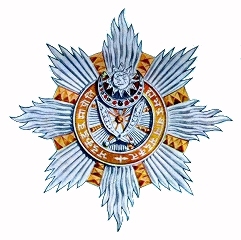 Awarded in one class only, to reigning sovereigns. The Birendra Chain (Birendra Mala): founded by King Gyanendra on 29th December 2002 in memory of his late brother, King Birendra. 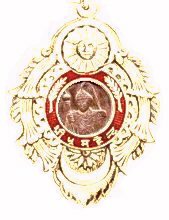 Awarded in one class only, to reigning sovereigns. 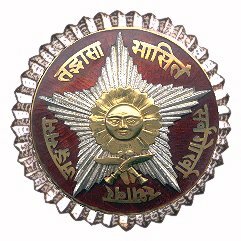 The Nepal Decoration of Valour (Nepal Soubhaga Bhaskara): founded by King Mahendra on 26th December 1963. Awarded in one class only, to reward acts of supreme gallantry in the presence of the enemy. 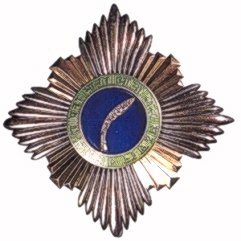 The Nepal Decoration of Honour (Nepal Pratap Bhaskara): founded by King Mahendra on 25th December 1966. The decoration consists of the Sovereign (Parama-Nepal-Pratap-Bhaskara), Grand Master (Ati-Nepal-Pratap-Bhaskara), and ordinary members (Nepal-Pratap-Bhaskara). Conferred on members of the Nepalese and foreign Royal houses. The Most Glorious Order of the Ojaswi Rajanya (Ojaswi Rajanyako Manapadvi): founded by King Tribhuvan on 14th May 1934. The order consists of the Sovereign (Parama-Ojaswi-Rajanya), Grand Master (Ati-Ojaswi-Rajanya), and ordinary members (Ojaswi-Rajanya). Conferred on members of the Nepalese and foreign Royal families and foreign Heads of State. The Tribhuvan Order of the Footprint of Democracy (Tribhuvan Prajatantra Shripada): founded by King Mahendra in honour of his father on 2nd May 1956. Conferred exclusively on Nepalese citizens for valuable services to the country associated with the revolution which removed the Rana regime. The order consists of the Sovereign (Parama-Gaurabmaya-Tejaswi-Tribhuvan-Prajatantra-Shripada), Grand Master (Ati-Gaurabmaya-Tejaswi-Tribhuvan-Prajatantra-Shripada), and ordinary members in five classes (1. Maha-Gaurabmaya-Tejaswi-Tribhuvan-Prajatantra-Shripada, 2. Sugaurabmaya-Tejasvi-Tribhuvan-Prajatantra-Shripada, 3. Gaurabmaya-Tejaswi-Tribhuvan-Prajatantra-Shripada, 4. Tejaswi-Tribhuvan-Prajatantra-Shripada, and 5. ribhuvan-Prajatantra-Shripad). 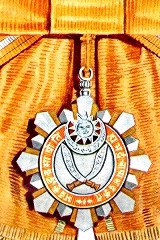 The Tribhuvan Order of Democracy - First class, sash badge (L) and Second class, breast star (R). The Order of the Footprint of Nepal (Nepal Shripada): founded by King Mahendra on 16th December 1962. Conferred exclusively on Nepalese citizens for significant contributions to national prestige. The order consists of the Sovereign (Parama-Ujjwala-Kirtimaya-Nepal-Shripada), Grand Master (Ati-Ujjwala-Kirtimaya-Nepal-Shripada), and ordinary members in five classes (1. Maha-Ujjwala-Kirtimaya-Nepal-Shripada, 2. Ujjwala-Kirtimaya-Nepal-Shripada, 3. Sukirtmaya-Nepal-Shripada, 4. Kirtimaya-Nepal-Shripada, and 5. Nepal-Shripada). 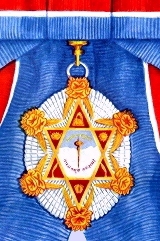 The Order of Nepal Shripada - First class, sash badge (L) and Second class, breast star (R). 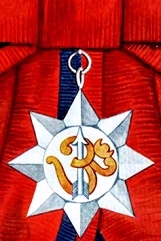 The Most Refulgent Order of the Star of Nepal (Nepal Taradisha): founded by King Tribhuvan on 19th November 1918, to reward military services during war and peace. 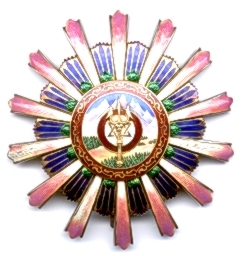 The order consists of the Sovereign (Parama-Projjwala-Nepal-Tara), Grand Master (Ati-Projjwala-Nepal-Tara), and ordinary members in five classes (1. Supradipta-Manyabara-Nepal-Tara, 2. Pradipta-Manyabara-Nepal-Tara, 3. Manyabara-Nepal-Tara, 4. Manya-Nepal-Tara, and 5. Nepal-Tara). 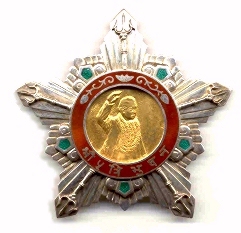 Attached to the order is a medal (Nepal-Tara-Padak) instituted by King Tribhuvan in 1936. 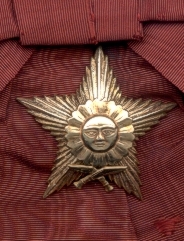 The Order of The Star of Nepal - Second class, breast star (L) and neck badge (R). 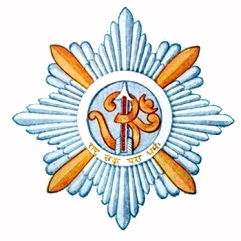 The Order of Om Ram Patta: founded by King Tribhuvan on 31st October 1946 and conferred on both Nepalese and foreign nationals of the Hindu faith. The order consists of the Sovereign (Parama-Pravitra-Om-Ram-Patta), Grand Master (Pravitra-Om-Ram-Patta), and ordinary members (Om-Ram-Patta). 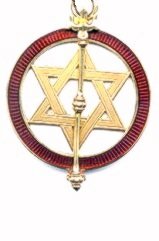 The Order of Om Ram Patta - breast star (L) and sash badge (R). (1. 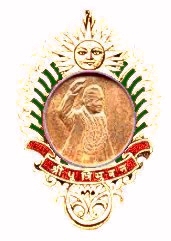 Maha-Gaurabmaya-Supradipta-Birendra-Prajatantra-Bhaskar, 2. Gaurabmaya-Supradipta-Birendra-Prajatantra-Bhaskar, 3. Supradipta-Birendra-Prajatantra-Bhaskar. 4. Pradipta-Birendra-Prajatantra-Bhaskar). 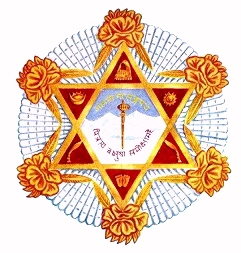 The Most Illustrious Order of the Three Divine Powers (Tri Shakti Patta). founded by King Tribhuvan on 27th November 1937. The order consists of the Sovereign (Parama-Jyotirmaya-Tri-Shakti-Patta), Grand Master (Ati-Jyotirmaya-Tri-Shakti-Patta), and ordinary members in five classes (1. Jyotirmaya-Subikhyat-Tri-Shakti-Patta, 2. Subikhyat-Tri-Shakti-Patta, 3. Bikhyat-Tri-Shakti-Patta, 4. Prakhyat-Tri-Shakti-Patta, and 5. Tri-Shakti-Patta). 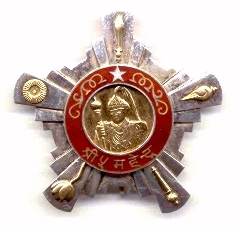 Attached to the order is a medal (Tri-Shakti-Patta-Padak) instituted by King Tribhuvan in 1936. 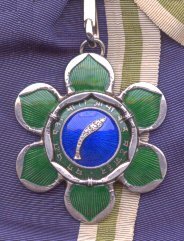 The Order of Tri Shakti Patta - First class, breast star (L) and sash badge (R). The Most Puissant Order of the Gurkha Right Hand (Gorkha-Dakshina Bahu): founded by King Prithvi in 1896, and revived and reformed by King Tribhuvan on 7th September 1932. The order consists of the Sovereign (Parama-Suprasidha-Prabala-Gorkha-Dakshina-Bahu), Grand Master (Ati-Suprasidha-Prabala-Gorkha-Dakshina-Bahu), and ordinary members in five classes (1. Suprasidha-Prabala-Gorkha-Dakshina-Bahu, 2. Prasidha-Prabala-Gorkha-Dakshina-Bahu, 3. Suprabala-Gorkha-Dakshina-Bahu, 4. Prabala-Gorkha-Dakshina-Bahu and 5. Gorkha-Dakshina-Bahu). 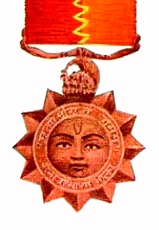 Attached to the order is a medal (Gorkha-Dakshina-Bahu-Padak) instituted by King Tribhuvan in 1936. The Order of the Gurkha Right Hand - First class, breast star (L) and sash badge (R).